The Collie Specialty will be held on Saturday, 3-2-19 & Sunday, 3-3-19, at Springfield Oaks County Park. The address is: 12451 Andersonville Road, Davisburg, MI 48350. TCCR will be selling merchandise. The Collie Nationals will be held in Peoria, IL from March 22 - 30, 2019, at the Peoria Civic Center. TCCR's Annual Garage Sale, Saturday, 4-13-19 and Sunday, 4-14-19, 8:00 AM - 5:00 PM. Donations welcome. 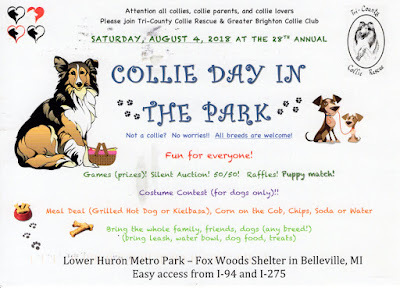 Collie Day in the Park, Saturday, 8-3-19, Lower Huron Metro Park, Belleville, MI. Tulip Tree (change of location in the park). Saturday, August 4, 2018. Fun starts at 10:00 AM. TCCR is now accepting Shetland Sheepdogs aka Shelties into foster homes. If you know of a Sheltie in need of rescue, please contact Mary, TCCR's adoption coordinator, at mary@collierescue.com. TCCR rarely has available dogs that make it to the webpage. That is because people who already have an active application with TCCR are given first chance at dogs as they come in. Fortunately, dogs are usually adopted almost as soon as they come into foster. If you are interested in adopting a Collie or Sheltie from TCCR, please submit your application HERE. Desmond "Desmond" (aka: "Desi or Des") has been moved to hospice due to complicated and severe medical issues.